Republican presidential candidate John McCain spent $37 million in September, leaving him $47 million for the campaign in October. McCain's monthly financial report filed with the Federal Election Commission shows he spent nearly two-thirds of his money  $22.5 million  on advertising as he tried to keep up with rival Barack Obama's ad blitz in battleground states. McCain is no longer raising money because he is participating in the presidential election public financing system. He received $84.1 million in early September from the federal treasury and cannot exceed that amount in spending between early September and Election Day Nov. 4. McCain's numbers stand in sharp contrast to Obama's. The Democratic nominee is not participating in public financing and raised a record-shattering $150 million in September. Obama has been outspending McCain this month in advertising by a ratio of about 4-1. 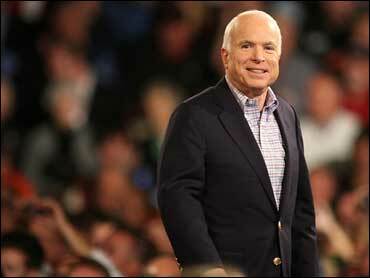 McCain has received significant help from the Republican National Committee, which raised $66 million in September. The party can spend up to $19 million in coordination with the campaign. The party and McCain have also split the costs of "hybrid" ads that criticize Obama as well as Democrats in Congress. McCain campaign manager Rick Davis said Monday that "a vast majority" of the campaign's $22.5 million in ad spending was in conjunction with the RNC, essentially doubling the value of its September ad spending. The RNC has also set up an independent expenditure operation to run ads that help McCain, but which cannot be coordinated with the candidate's campaign. The RNC budgeted about $18 million for those types of ads during the final two-week stretch of the campaign. Davis reiterated the campaign's complaint that Obama has not disclosed the identities of the hundreds of thousands of donors who have contributed less than $200 to his campaign. Legally, political campaigns are only required to identify in federal reports those donors whose contributions exceed $200. The Obama campaign on Sunday reported that it had added more than 600,000 new donors in September for a total pool of contributors of about 3.1 million. It said the average donation was $86. That means the campaign does not have to itemize the donations of a significant number of contributors. "The vast majority of those are probably legitimate but they are being kept secret by the Obama campaign for no good reason," Davis said. McCain's reports to the Federal Election Commission also only reveal donors who give more than $200. But a searchable data base on his campaign Web site identifies all donors, no matter what amount they give. In a sign of its tighter budget, the campaign cut back its travel spending in September to about $1.7 million compared to the $3 million it spent in August. Its payroll costs remained roughly the same at $1.2 million. The campaign borrowed $7 million from a separate campaign compliance fund to cover advertising and air charter costs incurred in early September before McCain received the $84 million from the federal government. The compliance fund is used to pay for legal costs associated with McCain's participation in public financing and to meet legal requirements of campaign finance law. The campaign repaid the loan later in the month.